About 35 Rural/Metro employees and Teamster union members were in City Hall Tuesday, urging the city to retain Rural/Metro as the city’s ambulance provider. Unionized employees of Rural/Metro Medical Services pushed back hard Tuesday against the suggestion that the company could lose its exclusive contract to provide ambulance service in the city. About 35 Teamsters and their supporters came to City Hall to urge lawmakers not to change ambulance providers. The public pleas follow a letter submitted to the city’s ambulance board last week by South Council Member Christopher P. Scanlon, in which Scanlon expressed dissatisfaction with Rural/Metro’s response times. Three proposals are under consideration by the city for a new contract to handle the more than 30,000 medical emergency calls the city receives every year. Rural/Metro, American Medical Response and a third company are seeking the contract. “I can tell you that Rural/Metro is trying to make very positive change,” Joseph Little, an emergency medical technician, told the Council’s Finance Committee. Little, speaking on behalf of his colleagues, said that many things that affect response times, such as road construction, delays at hospitals and patient misuse of the 911 system, would not change with another ambulance provider. 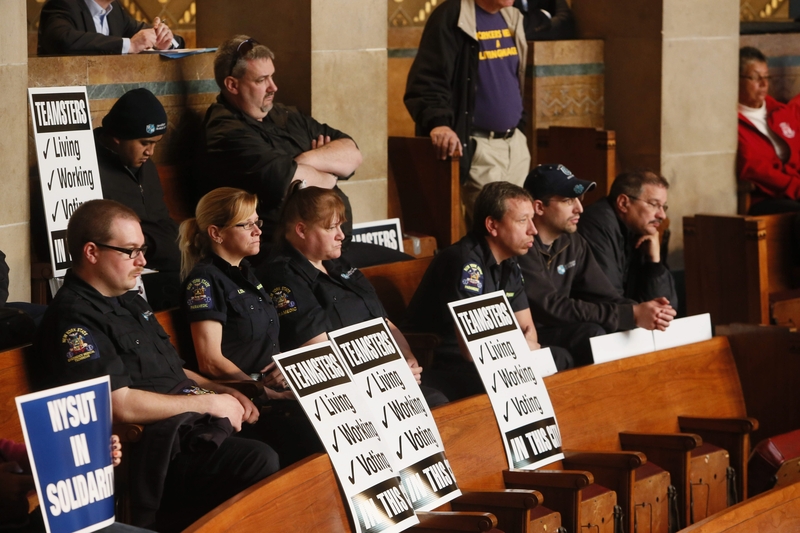 Richard Lipsitz, president of the Western New York Area Labor Federation, AFL-CIO, asked the Council not to switch service providers, which he said could jeopardize the progress that has been made in ensuring emergency medical technicians are paid the city’s living wage. The Brown administration is reviewing proposals from ambulance providers and hopes to complete its review by mid- to late-May, in order to have a contract in place by July 1, when Rural/Metro’s current contract expires. Once the administration’s review is complete, it will send the name of its recommended provider and a new contract to the Council for approval. Scanlon noted a recent accident on Cushing Place, in which victims were first treated by the city fire department. Rural/Metro did not arrive until 13 minutes after the call, said John P. Karolczak, chief relations officer with Rural/Metro. Karolczak said it is common for the fire department to arrive first at medical calls. Members of Rural/Metro’s management team also attended Tuesday’s meeting. “I’m very proud of the service we’re providing now,” said Jay Smith, regional director of Rural/Metro. He noted that the current contract places a premium on matching the appropriate level of medical response to each call, and that response times are not the top priority. “We think the model we have in the city of Buffalo is doing a good job,” he said. Scanlon said he wants to make sure response times are included in the new contract and that whoever has the contract employs enough people to cover the calls. He said he never questioned the commitment of individual emergency medical technicians.